At Squadhelp, creatives earn points for several different activities on the platform. For example, you can earn points when you receive high ratings on your contest submissions. You also earn points when you receive a bonus or for winning contests. In addition, points can also be earned by listing your domains for sale in Squadhelp Premium Domain Marketplace. The overall objective of the point system is to improve the quality of entries being submitted and to reward our high performing users with additional benefits. 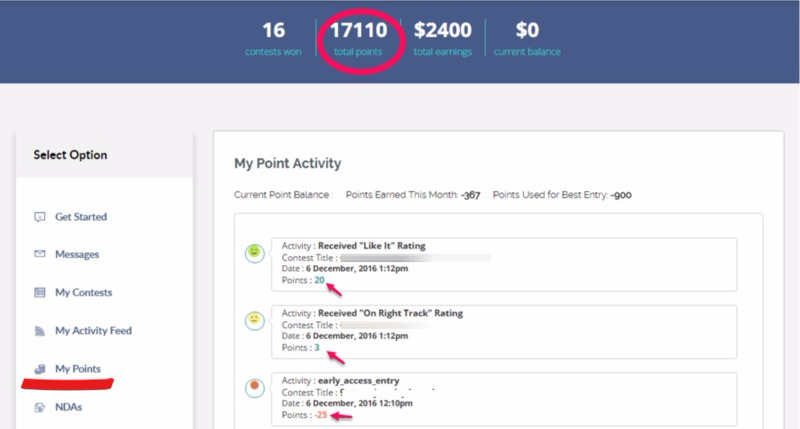 In order to see your points activity, you can go to My Account and click on “My Points”. Here’s a direct link to your Points Activity. Creatives who earn points receive additional privileges such as the ability to participate in contests early. You can also use your points to highlight up to 2 submissions per contests as “Best Entries“, which can increase the visibility of your entry. Your points can also be used to submit unregistered domains to Marketplace. This allows you to build a portfolio of domains without making any upfront investment. You can use your points to pay for partial renewal fees for your SH registered domains. You can also use your points to boost your domain ranking in the Marketplace.